This sampler was worked in 1812 by Mary Hamilton at the Maytown, Pennsylvania, school of Catherine Welshans (who became Catherine Welshans Buchanan after her 1813 marriage). The central scene depicts a woman, fashionably attired in a feathered headdress, standing beneath a tree. The border is made up of compartmentalized motifs, including baskets of flowers, flowering sprigs, grape vines, birds in trees, and an inscription. 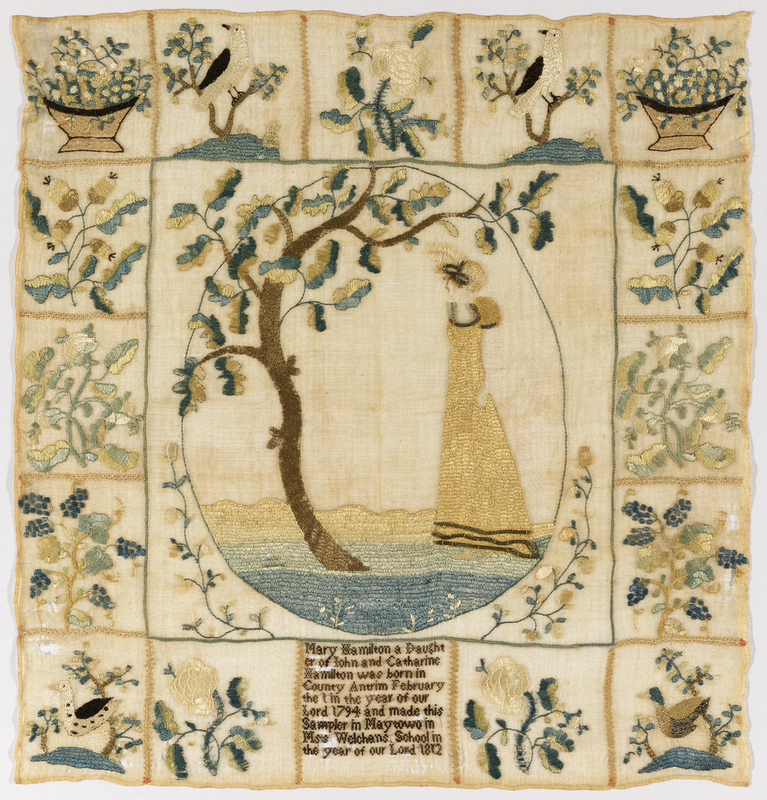 A related sampler in the collection of the Cooper Hewitt – also featuring a pastoral scene and a border of decorative motifs enclosed in squares – was worked at Mrs. Buchanan’s Wrightsville school in 1819 by Mary Fitz (1807–1849). The same image of a bird, perched on a branch and looking over its shoulder, is found in the border of both samplers. Catherine Welshans Buchanan (1792–1852) taught in Maytown, Wrightsville, and Marietta. Samplers worked under her instruction are very similar those made at the Lancaster and Harrisburg schools of Leah Galligher Maguire (1764–1830). Elements found on samplers from the Buchanan school, such as pastoral scenes, compartmentalized decoration, and the use of human hair and metallic thread, appear to have originated at the Maguire school. Catherine was evidently influenced by Leah’s sampler patterns, and may have even studied at her Harrisburg school. Born in 1794, Mary Hamilton was the daughter of John and Catherine Hamilton. At eighteen years of age, she was older than the majority of early nineteenth-century sampler makers. Mary’s sampler states that she was born in County Antrim. Her family may have been from Antrim Township in Franklin County, Pennsylvania; however, it is also possible that they emigrated from Antrim County, Ireland. During the early 1700s, many Scottish-Irish left Ireland in search of religious freedom. Many settled in the Maytown area, where they founded the Donegal Presbyterian Church – still in existence today – on the outskirts of the town in 1721.